Gone are the days of giant pots on the stovetop for making corn on the cob. Thanks to your pressure cooker you can have your corn perfectly cooked in just 1 minute! All you need is corn and a cup or two of water and you are set for delicious, sweet, summery corn on the cob. 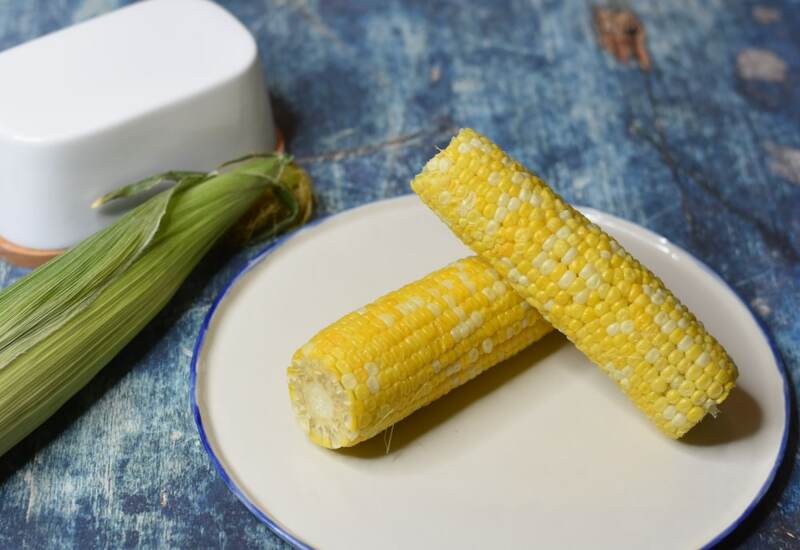 You will keep your kitchen cool and have corn in no time! Top corn with butter (or butter substitute), salt, and ground black pepper to serve. Feeding a crowd? Want to fit more corn in the pot? If you cut the shucked ears of corn in half to make 2 shorter pieces of corn you can fit many more into your pressure cooker. Per Serving: 99 calories; 2g fat; 21.6g carbohydrates; 4g protein; 0mg cholesterol; 262mg sodium. We increased the cooking time to 2 minutes for 6 ears and it came out perfect! I do microwave,4 min per ear in the shuck. Cut to big end off the cob after cooking and squeeze the corn out for NO silk! So easy I don't think I would get my multipot out and have to clean it up. But thats just me of course. So easy and so good!!! I’m always going to make corn this way from now on! So easy and doesn’t require constant watch. And if it’s done before the rest of your food, it stays nice and warm in the pot. This recipe worked well, even for what looked like, old corn on the cob. Will use this recipe again. So easy. Had 5 ears of sweet Utah corn and cut them in half and stacked on the trivet. Did 3 mins on High and came out perfect. Sliced off the cob as I’m food prepping and will freeze some but need to go get more fresh corn and make to stock up!